What is the purpose of the windshield in a modern vehicle? Is it a weather barrier, a projectile shield, a bug screen? In reality, a windshield is all those things and more, including a safety device. It is as important to your security while on the road as a seat belt, child seat, or even the air bag. The windshield is designed to keep occupants from being thrown from the vehicle in case of a frontal impact, to support the roof in a rollover accident and to position the passenger-side airbag for the most effective protection. Properly bonding that windshield to the vehicle's body is paramount to the safety of the occupants. This course is designed to help you understand the changing role of glass in the automobile, including its introduction, production, and evolution, and ending with new innovations that will make driving easier and safer in years to come. Glass is a material made naturally, when extreme heat and sand are combined. This material, first found at the foot of volcanoes, is called obsidian. The first use of obsidian was for jewelry and other decorative products. Later, it was used for arrowheads, cutting utensils, and weapons. As the centuries passed, artisans learned to alter glass, after heating it, to form many usable items such as drinking vessels, bowls, and window glass. Modern glass is made up of four major ingredients; sand, soda ash, dolomite and limestone. Each of these materials contributes to the success of the manufacturing process. Silica sand contributes as much as 70% of the glass recipe. Soda ash, the most expensive ingredient in glass, provides easier melting of the raw materials. Dolomite provides better working and weathering properties. Limestone adds to the durability of the finished product. Most glass manufacturers also utilize recycled glass, called cullet, in the manufacturing process. In addition to reducing material costs, cullet also melts at a lower temperature, thus reducing energy costs. Once the glass is manufactured and cut to shipping sizes, it is sent to be fabricated. Fabrication is the act of refining a manufactured item into a finished product for sale. When auto glass is fabricated, it becomes a windshield or a tempered auto glass part. A windshield today is made up of the two pieces of annealed glass with polyvinyl butyral (PVB) sandwiched in between. A tempered piece is a single piece quickly cooled to provide extra impact resistance, as we will explain later in this module. There are two types of manufacturing processes used in making glass, the sheet method, and the float method. To make glass using the sheet method, the glass is vertically stretched, in the molten state, to the desired thickness. Because the quality capabilities are very limited with this process, today this flat glass method of production is usually found only in less developed countries. The float method is by far the most widely used process, today. The float method starts with the raw materials, mixed and melted in a refractory tank. Once the molten glass is melted and refined, it is forced through a narrow opening onto a bed of molten tin. Glass is lighter than molten tin, so it floats, much like oil on water. The glass is then slowly cooled to a temperature of 1130°F, where it becomes rigid and is lifted off the molten tin by a series of lift out rollers. The glass is then slowly cooled or annealed. This allows the glass to be cut and shaped later. On the first automobiles, there were no windshields. The speed of the Model T's was only a few miles per hour, and the only safety problem was bugs and debris getting into one's eyes. Most occupants of the early vehicles protected themselves with long coats, sometimes referred to as "slickers", and goggles. As vehicle engine power increased, so too did the demand for further comforts and protection from flying projectiles. The first use of a windshield on a motor vehicle was on racecars. A round, glass windscreen was mounted directly in front of the driver to improve the visibility. 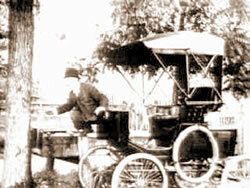 This new addition to the automobile became a popular option for road worthy cars between the periods of 1907 and 1910. Most car owners of the time enjoyed the fact that the automobile was an open-air vehicle. The air rushing by their bodies lent a sense of exhilaration, not felt in slower moving carriages. This is why most of the new windshields were installed movable frames to allow airflow through the vehicle. When vehicles started to reach speeds of 25 miles per hour and more, it decreased the exhilaration of having the wind in one's face. In 1910, the Cadillac was the first vehicle to have an all enclosed body. This new advance in vehicle design increased in popularity, between 1915 and 1920 and greatly increased the use of glass. Before 1920, the role of auto glass was primarily for comfort. However, as roadways improved, speeds increased and the popularity of the motor vehicle grew, the role of auto glass was changed. 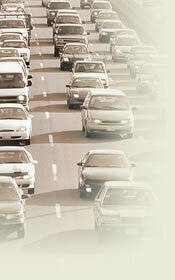 In the early 1920s, vehicle accidents increased dramatically due to vehicle population on the roadway. The first windshields were constructed of a single sheet of annealed glass. When annealed glass breaks, sharp shards of glass would fly into the face and bodies of the occupants, thus causing serious injuries. It is estimated that in 1923, half of all persons injured in auto accidents were hurt by broken glass. It is said that a friend of Henry Ford's received serious injuries due to glass breakage when he was involved in an auto collision. This caused Henry Ford to investigate a new invention called laminated glass. A French scientist by the name of Edouard Benedictus accidentally dropped a flask coated in dried out cellulose and discovered that the cellulose held together the glass shards of the dropped flask. 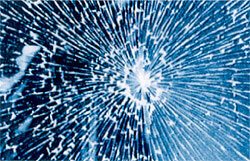 This breakthrough led to the invention of laminated safety glass in 1913. The first generation of laminated glass was two panes of annealed glass with a coating of cellulose sandwiched in between. It was first used in the gas masks of World War I. Henry Ford realized that utilizing laminated glass technology in his automobiles would greatly decrease injuries due to glass breakage, and incorporated this safety glass into his new vehicle designs. 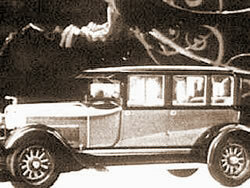 By 1929, laminated glass was used in all of the new Ford vehicles. The introduction of laminated glass was the first time that glass played a direct role in the safety of a vehicle's occupants, but it wouldn't be the last. There were two major problems with the first generation of laminated glass as it aged; one, the discoloration of the cellulose inner layer, and two, the ease with which the cellulose could to be punctured. These two problems were solved in the late thirties with the introduction of a material called poly vinyl butyral (PVB). PVB is a plastic material that is usually .030 inches thick when used in a windshield. At that thickness it is very difficult to penetrate, even with the forces applied to it in an accident. It is also less susceptible to discoloration, making visibility better. By 1966 laminated glass containing PVB was required in all vehicles by Federal Motor Vehicle Safety Standard 205. By the mid to late 30s, glass usage increased dramatically in the new enclosed vehicle designs. The auto parts were primarily made out of laminated flat glass. The flat glass was cut to size and installed in metal frames or into rubber gaskets. The glass mounted in frames required cushioning to prevent fracture. The two materials used to cushion the frame-mounted glass were called "EverSeal" a rubber type material that absorbed oil and "Tuf-Pack" a cork and fabric material. Glass in gasket mounted parts was cushioned by the rubber of the gasket. As vehicles evolved, safety became a bigger concern. Tempered glass was developed in 1938 and soon began playing an ever-increasing role for the glass in doors, vents (sidelites) and for rear windows (backlites). Tempered glass was rapidly cooled after it was formed, causing it to develop an outer "skin" that made it stronger than laminated glass. Tempered glass had the flexibility to be formed to much more complex shapes with an overall thickness that was significantly less than the laminated glass. In addition to being stronger, it was cheaper to fabricate than laminated. Tempered glass, unlike annealed glass, is quick cooled rather than slow cooled. This causes the outer surface to harden faster than the core. As the core hardens, it causes pressure on the outside surface, giving the glass additional strength to withstand the closing of the door. Unlike annealed glass that fractures into long sharp shards, tempered glass shatters into relatively small dull pieces. Almost all the glass found in today's cars and trucks is tempered, with the exception of the laminated windshield and the occasional laminated back glass. Look for an increase in laminated side parts in the future however, due to efforts to prevent ejection of occupants through the side glass in the event of a crash. Another huge innovation came in 1947 when Studebaker Motors designed the new Starlight Coupe with a curved windshield and back glass. Prior to this, all auto glass was flat and could be fabricated by any glass professional. Curved glass meant that the glass must be produced by special fabricating procedures not usually found in the typical retail glass shop. 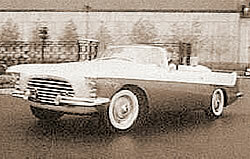 After World War II, vehicle design incorporated curved glass on many parts of the vehicle. This change meant that glass covered a larger percentage of the vehicle's surface than ever before. Although this improved visibility, the bigger glass areas also increased solar heat gain. Glass manufacturers responded with the introduction of tinted glass. Iron oxide was added to the glass batch, adding a blue or blue-green color to the glass. As technology grew in the lamination process, other advances were made to decrease infrared light absorption. Glass manufacturers were able to add a darker band of color at the top of the windshield, called the Sunshade, by applying a dye to the top of the PVB inner layer of the windshield. All early glass was manufactured by the sheet method, in which flowing molten glass is stretched onto a flat surface, ground to the desired dimensions and then slow cooled. This was a slow and arduous method of manufacturing glass, which also produced defects, distortions, and imperfections. In 1959, Alistair Pilkington invented the float process. The process, which was described earlier, greatly improved the quality and the clarity of glass in the marketplace and has quickly become the method of choice by modern day glass manufacturers. Obviously, the best way to save fuel is to reduce weight and size. Vehicle manufacturers reduced weight in every way possible. Manufacturers reduced the amount of steel in the vehicle, incorporated more plastic parts, and required more (and thinner) glass to be used in the vehicle's design. Glass has a smoother surface than paint thus reducing the drag coefficient. It is also lighter weight than steel, thus improving fuel efficiency. Today's vehicles are safer than they have ever been. Auto glass and its proper installation is essential to this crash worthiness, whether that glass is installed by the vehicle manufacturer in its initial assembly or by the auto glass technician who replaces it in the aftermarket. The added role put on auto glass, to protect occupants in a crash, meant that the glass must be bonded to the body of a vehicle by a fail-safe method. This requirement was met by the introduction of polyurethane as the bonding adhesive. Urethane, as it is commonly known, is a very special moisture-attracting adhesive with tremendous bonding strength characteristics. In comparison, the prior glass adhesive, butyl, has approximately 30 pounds per square inch of tensile strength, while urethane has approximately 1000 pounds per square inch of tensile strength. This strength is necessary for windshield retention, roof support and airbag deployment in the event of a crash. The first use of urethane in a production vehicle was on a 1973 Oldsmobile Cutlass. The success of this adhesive paved the way in 1974 for General Motors and other vehicle manufacturers to incorporate it in their entire car lines as new models were introduced. Currently, every passenger vehicle and truck under 10,000 pounds gross vehicle weight uses urethane to bond the windshields to the car body. Auto glass has come a long way from the flat piece of annealed glass found on early automobiles. Many modern auto glass parts have value added components that enhance safety, comfort, and styling. Let's take a quick look at some of the innovations incorporated into the new modern-day auto glass. Some or all of these jobs can be accomplished with one or more antennas. Some are mounted on fenders, some on roofs and others fabricated on to the glass surface. Another type of pre-fabricated auto glass part is called an encapsulated part. The difference between a bonded part and an encapsulated part is the method by which the moldings are attached. Bonded parts utilize adhesives, fasteners, or pressure fitting a molding or part to the glass. The attached part can be removed from the glass, if necessary. In the encapsulation process, the glass part is inserted into a mold. Molten plastic or rubbery material is injected around the perimeter of the glass part and melds itself to the glass surface. This material cannot be removed from the glass once the glass is encapsulated. There are two types of heated auto glass parts, a metallic painted grid applied to the surface, such as a rear window defroster, or a metallically coated inner surface of a laminated unit. The latter type of heated glass comes from aerospace technology. It was first used on military jet fighters to keep the pilot canopy free of frost and haze. This type of heated glass, when used in an automobile, can eliminate ice up to 1/4" in thickness in minutes eliminating the need to wait for the engine coolant to warm up and defrost the glass from the inside. As we learned earlier, the surface of the automobile has a higher and higher percentage of glass. As the surface area of glass increases, interior components are susceptible to damaging ultraviolet light. It also allows hot, infrared light to penetrate and warm up the vehicle's interior. These two spectrums of light can cause some damaging and uncomfortable consequences. Ultraviolet light can damage interior plastic and fabric components. Infrared rays will cause the vehicle's air-conditioning system to work harder than it has to. Glass manufacturers realized these problems, and designed what is known as solar glass. Certain materials are added to the glass batch to give the glass absorbing properties to fight the harmful affects of ultraviolet and infrared light. Metallic coatings (similar to those mentioned under Heated Glass) can be applied to one of the surfaces that are laminated inside a windshield. This coating reflects the heat out of the vehicle. One of the most popular vehicles on the road today is the Sport Utility Vehicle (SUV). When this vehicle was first introduced, it was marketed heavily towards the working man. The service professional often kept his tools and important supplies in the back of his vehicle. By design, the SUV was surrounded by glass. To protect the contents of the vehicle, the glass manufacturers introduced privacy glass. Privacy glass is a very dark tinted glass that will allow occupants to easily look out, but will not let others to peer in. Privacy glass can only be used from the "B" pillar to the rear of the vehicle, only on trucks, vans, and SUV's. It cannot be used in the windshield, nor the front doors or front vents, so as not to obstruct driver visibility. A rain sensor is a new innovation that is not part of the glass, but is attached to it. The rain sensor is a device that senses the spectrum of light that passes through a drop of rain and instructs the windshield wipers to work at the speed necessary to clear the windshield. Rain sensors can be attached to the glass by means of an optically clear double faced tape, clipped to a bracket bonded to the glass surface, or mounted in the base of the rearview mirror. The lens of the rain sensor is very sensitive and will not work if it is scratched or damaged in any way. Hydrophobic glass is a new technology. It is a term used for a piece of glass treated with a film applied in liquid form and allowed to cure. It is designed to act like a waxed surface, causing raindrops to bead up and rolls off the glass surface as the vehicle drives down the roadway. In the future, this film will be permanently affixed to the glass surface, thus reducing the need to run the wipers. As we learned earlier, tempered glass was incorporated into the vehicle design of the hardtop, to prevent the need for a frame around the door glass and complement the open style of design. Since then, safety concerns have become more prevalent and the hardtop has become outdated. If a vehicle were involved in a rollover accident, tempered glass would break and allow the occupants to be thrown from the vehicle. The glass manufacturers, always looking to improve their products, designed a new type of glass called heat strengthened laminated glass. Two pieces of heat-strengthened glass (somewhere between annealed and tempered glass) are laminated together with PVB. This new product not only reduces the likelihood of an occupant exiting the vehicle, it also makes it difficult for a thief to break in. This product also significantly reduces the level of UV rays that enter the vehicle and reduces the noise level inside. In summary, the role that glass has played in the automobile has changed greatly over the last century. It has gone from a transparent panel, keeping the wind out of the face of the driver, to a safety device that contributes to the crash dynamics of the vehicle. But no matter how much technology is incorporated into the glass design, the auto glass technician is responsible for the correct installation of the glass to the vehicle's body. Only by learning and consistently practicing correct installation procedures can the technician, the glass shop owner, and the customer all be protected from injury and potential liability.